Webtrends trend reports break down monthly data by daya, but you can’t see the results for a specific page without creating a custom report. Having seen this request twice in a couple of months I thought I would share how to do it! Unfortunately it is necessary to create a custom report as the trend reports available don’t break the metrics down by page. It isn’t perfect but at least you get the information. P.S. If you can find a way to improve this, please share! Website analytics are rather like accounting systems in that they look back at what has happened and, whilst the past can be used to be help predict the future, a Balanced Scorecard approach needs to draw on other, forward-looking information. Website analytics search reports are excellent indications of what is working in terms of driving visitors to your site. But how can you find out about that vast majority that haven’t come to your site? What are they looking for? Even if you feel that Pay Per Click advertising (PPC) is not for you, there are free tools available that were created to understand what people are searching for. One obvious example is Google’s “Keyword Tool” (https://adwords.google.com/o/KeywordTool), which provides you both Global and Local Search volumes not just of the keyword you type in, but all variations on it (including many you may not have thought of!). You can apply various filters and even enter your competitor’s URL to find out how their site is optimised for search and therefore getting traffic for. Social Media provides a wonderful opportunity to listen in to conversations about your own brand, your competitors and the market in general. Being a new industry there are still many vendors with offerings at every level of sophistication (and price!). As a minimum you should be regularly monitoring a variety of key phrases through a free tool such as Twitter or HootSuite and, if you want to interact with those conversations, consider tools like Radian6 or uberVu, which add a level of automation and aggregate reporting on metrics such as “sentiment”. This is where digital analytics finally comes into its own. What Search phrases drive Visitors? What do they search for when they get there? Do they search for things but cannot find them? Also, even if you think you only have a website, your visitors will get different views of you on their pc, tablet and SmartPhone. Studies have shown people browse on a tablet and then go and buy on a pc. Is that true for you? Do you understand how behaviour changes dependent on the device and can you use that? To ensure that you keep ahead of the game, you should be using everything at your disposal, making it available to the key staff in your organisation and building it into the culture to use it to inform decisions. The information is there in a way is has never been before; use it, your competitors will! What strange search terms have you found on your site? It is nearly the end of the year and a time to reflect on the whole menagerie of Google changes from Pandas through Penguins to Hummingbirds! To a greater or lesser extent, these have had an effect on the rankings of your pages and leads us to ask the question – how can we keep up? For obvious reasons, Google doesn’t publish its algorithms, so you would have to spend ages scanning the net to find out what the gurus think. This is fine for the professionals, but for the average business, which just wants to blog or create some additional pages it is far too time consuming. That is where getting into the head of Google comes into its own! At its heart Google is a Search Engine. If a “better” search engine came out tomorrow, we would all start using it and Google’s business would disappear overnight. This is why they are constantly striving to improve – they need to stay ahead of the pack. Therefore the page at the top of the rankings is the one Google believes best fits what was being searched for. After all, if they don’t do that, someone else will! So, we need to make sure that Google thinks our page is the best. That is why “Content is King”. Read what is on your page dispassionately. Do you still think those pages that are beating yours in the rankings seem to answer the searcher’s question better than yours? If not, then improving your copy is the first place to start. So, how do we keep up with the raft of new animals Google will introduce next year? Answer: Think like Google; “if I am a robot reading this page am I going to think it perfectly suits what my prospective visitor is going to want to read?”. I don’t know what further changes are coming down the line, but I do know what they will be trying to achieve, so if we align our goals with Google’s and try and achieve the same thing then everybody will be happy! A Harvard Business Review article by Tom Davenport caught my eye with this wonderful title as a neat distillation of our philosophy. I often say to people that if a report is not used as the basis of a decision, then it actually has a negative value taking up valuable time reading it when that time could be more profitably spent on something else! The article discusses how data is often captured, processed and stored, but then hidden away, “never seeing the light of day”, and this is something we see often in the world of web analytics. There are so many out-of-the-box reports that it is easy to become overwhelmed by the data, giving up and not using any of them. The key here is to sift through them, determine what is going to be important on a regular basis and hide the others. At the beginning of most implementation projects we typically hide 80-90% of the reports so that the only ones that are left are those that are going to contribute on a regular basis to the organisation’s decision making. That is not to say that the other reports should never be looked at. For one client who had to produce monthly web traffic reports we looked at the trend of Visits over both days of the week and time of day. Interestingly traffic at weekends was 80% of that on a week day and, even more surprisingly, traffic at midnight was still 80% of the daytime peak. This turned out to be entirely logical as their website was aimed at lorry drivers, who would be out working during the day and catching up on administration at home. However, it hadn’t been thought about before and all website maintenance happened at 6:00 pm as they thought no-one would be using it then. So, it was an easy and indisputable decision to minimise disruption by moving maintenance to the early hours of the morning instead (sorry IT guys!). We put these graphs in their monthly report so that the entire organisation gained a better insight to the website usage as a one-off feature. However, after that, we put both these reports on a shelf and didn’t bother with them again for a while, only checking them occasionally to ensure that there was no change. which encapsulates the process we follow with our clients, ensuring that we solve real problems with a measurable success. What is the first thing that people see on your LinkedIn profile? … Your photo. I am constantly amazed at the number of people that haven’t uploaded their photo – how can contacts be sure it is you? Sadly many potential connections will be lost because they won’t be willing to invest more than a few seconds in identifying the right “Fred Bloggs”. What should your LinkedIn profile photo look like? Many years ago I had a colleague who desperately wanted to work at one of the top Strategy Consultancies. At the end of the day he stood outside their office watching them all leave and noting what they wore so that, when he went for an interview, he would be able to dress the part. The finishing touch was buying a pair of glasses that he didn’t need because they made him look more intellectual and most of them wore them! Did he get the job? Of course he did! So, whenever you go to a job interview or a sales meeting, you should dress appropriately and your photo must reflect that same person. If your LinkedIn profile still has an avatar or you are using a Facebook picture taken at a party then get a proper one up there – NOW! 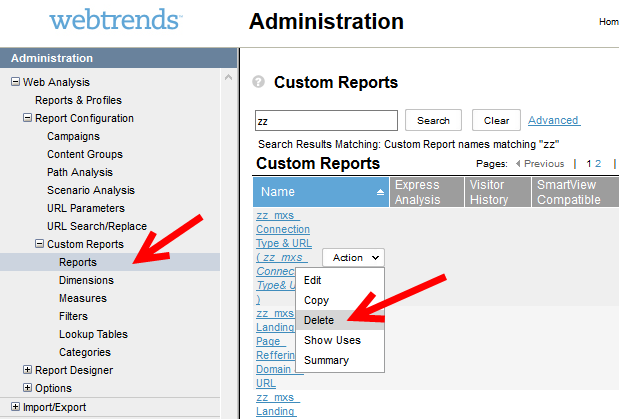 How to delete unused Webtrends reports! 7. If you are still sure that you want to delete the report, you need to remove it from each profile in the above list first. Click on Reports and Profiles and Edit each one. 8. Select Reports from the Advanced tab, scroll down to the relevant report and uncheck the box. Save the profile and repeat for all the others. 10. Confirm that you want to delete the report and add a Change Comment. Using Filters in Google Analytics. So what is Semalt, and what’s the problem? And if you’ve never used filters before, don’t worry here’s a step by step guide to removing the Semalt traffic. Note: this filter excludes Semalt.com but you could easily adapt it to filter other unwanted traffic such as internal employees. Don’t risk your data – create a new View. The first thing you need to do is create a new View. This is important because once a filter has been applied to a View the data cannot be unfiltered. For this reason it is recommended that you keep one unfiltered View that contains all of your data. Once you have created a View that you are happy to filter, click Filters in the Admin section of Google Analytics. Finally, tell Google what you want to keep and what you want to get rid of. In this case we want to filter out (exclude) anything with the referral path of /crawler.php this is the Semalt crawler. And that’s it. Your new View will report traffic minus Semalt so you can relax knowing you are reporting un-inflated traffic. If all that seems a bit too much, let us do it for you. Add ga@elignum.co.uk as a user on your Google Analytics Account and we will do the rest.